Goodbye Lullabye – Part 3. In Part 1 you can read about the reasons for these cards and the very start of making them. In Part 2 I show you how I made the backgrounds, and how easily distracted I am in going to create something else and how “just 10 minutes more” turns into 2 1/2 hours more of crafting. It’s Saturday morning now, and the results are on the table. (Oh that sounds like a horribly translated Dutch saying). It’s 06:18. I don’t really feel that tired, as I have gotten too much awake to be sleepy, and decide to craft a bit. The youngest is put in a baby-sleeper thingy (wippertje) in front of the television to distract him, he is a bit ill and I don’t want him to crawl around, he needs to sleep but doesn’t want to lay down. The baby-seat is a chair about 20 scm from the ground in which a baby can sit/lie, the backrest is adjustable. Anyway, I craft, he is being sleeping half upright in that seat. I put decoupage glue onto the bits where I pulled the top layer of the linencardstock off, to prevent it from ripping further and to seal it a bit again. I’m realizing that if I mess up a card beyond repair I am in “trouble” – this foil technique can’t be sped up with a heating gun. So I go make some backups. I think I’m being smart by not cutting the papers to size yet. The paint can react differently at edges, especially when spraying with water, so I try to use a whole sheet. Kissing with a twist – starting to realize this is was maybe not a good idea as the colours might mix too much. I sprayed with water/glimmer mist, wrapped it up in kitchen foil and stopped crafting at 06: 52. (Really can’t remember what I did. Put the youngest in bed and went back to bed myself I think). Don’t think I remember the exact time – it’s in the name of the picture :P.
While posting the otherp pictures I know what I did – select stamps to use! Must have taken me half an hour at least.. go through my stamps selecting something children related… I don’t have many stamps for that. And then the texts! At first I thought of a simple Thank You on the front, but I really wanted to put in some words of comfort, hope, as well. So a stack of text stamps was selected too. Then everything was put away as the others were waking up. Finished wrapping at 17:13. Ofcourse it didn’t take me 2 hours to wrap it (might have been 30 – 45 minutes though…) but didn’t start right away and was interrupted in between. I’ve taken the backup cards out of the foil and added some more paint to the too white areas. Wiped up the excess paint with extra cards (the Hema correspondence cards). I’ve got sooooo many cards to make with all these backgrounds I’m creating! Right. Not my best backgrounds results. Quickly put those aside and focus on the other ones. It’s Saturday, 20:24, and the meeting is tomorrow at 10:00…. In case you’re wondering what’s on the chair: a wooden childrens chair and a towel. I think I swept the floor and didn’t put the chair back down. ANyway, the cards. I had stamped with Stazon on to the cards – didn’t have a picture of that. The prints weren’t all that good, eventhough I had put a thin cloth under the paper. The foil technique creates an uneven surface (depending on how you smooth out the paint ofcourse, less paint and more water creates a smoother surface). So some keyparts, like the face of the reading girl, were not very visible. What to do? Stamp again with a stampruler, and emboss it with black. I have the brilliant (I think) idea to cover the allready stamped image with gesso, as I probably will not be able to stamp at the exact same spot, and as the reading lady has lots of black in it, details might get lost. Also, it enables me to use more options for colouring as more colorants take on gesso then on (glossy) paint. Just a thin coat, not necessary to cover the entire image. The girl has allready been gesso-ed and stamped/heat embossed with ultra fine black embossing powder. All images done this way. But what, weren’t ther 8 cards? That’s right, but as I still was doubting for the image on the other two cards, I hadn’t stamped that yet. It just looks soooo much better this way, they really pop off the card now. See the reading girl? I stamped her first on both cards, then decided I wanted to add a bit more, it became the childrens cart. I stamped that one on the pink card first, with the childrens cart completely visible. It somehow felt a bit off (the cart is floating, the chair of the girl is lower down) so I stamped it at a more correct height on the other card. No pictures of the last two cards, as it was 22:37 and I was in a creative flow, concentrated on what I was doing. Silly me, I can’t even mat the cards onto plain coloured cardstock when I’m in a hurry… I need to break the colour with slight pattern. I used the diluted ink spray again, see the blue cardstock. I put the stencil on a clean surface, placed a (Hema_ correspondence card on it and pressed it and lifted it carefully. Wauw! Love the result! I repeated this for pink matting cardstock (no pictures taken – it was 01:25 at the above picture). I think I’ve got about 6 extra backgrounds now as well. Or 8. For E. She was Tobias his best friend when we moved, he had a tough time adjusting and she was his friend. If she was there, it was good. Even at home, he often says her name instead of mamma (and vice versa at the daycare center.) She is a free thinking spirit, whom to me felt a bit out of place at that daycare center as it was a more regular/basic one. She would looove a more natural one, like the one my kids are going to now. Or a more adventurous one. She hasn’t found a job yet. She’s been eligble for some jobs, but they were 24/28 hrs and not allowed a second job. To be able to pay her house she needs at least a 36 hrs contract. Unfortunately, she has to follow her wallet/head now, instead of her feelings/heart. 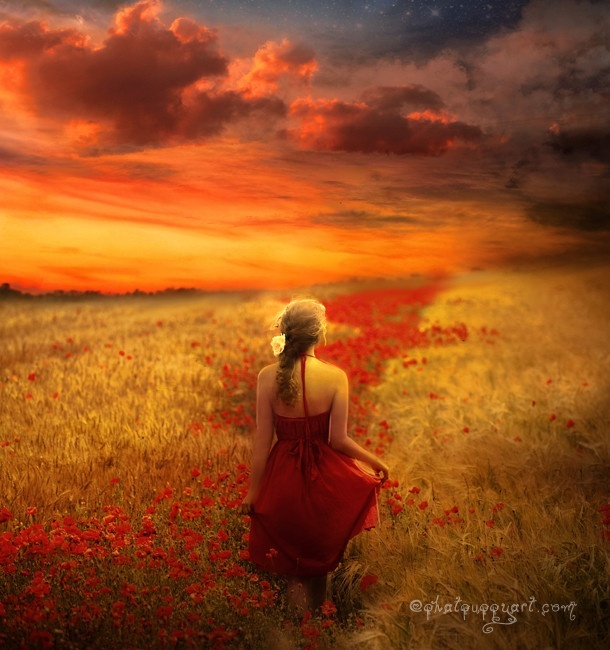 I do hope she finds a place where she can unfold her wings. Stamps used: text and girl from VivaLasVegaStamps, cart from Deep Red. For P, as she is fantastic with the babies. I know it isn’t a baby image but I only have one baby stamp. Babies like to “read” books too. She’s found a new job. Stamps used: cart from Deep Red, reading girl from Vivalasvegastamps, text from Crafter’s Companion Vintage Floral. For N. She wasn’t at the meeting today as it was too emotional for her. She has her own side business, decoplaats: http://decoplaats.wix.com/decoplaats which might get a new impulse, hence the text. I think she has a new job allready too. Stamps used: Text from Quietfire Designs, Rose from Christina Renée, Le Petit Prince and his sheep from Memi-s Rainbow on etsy (although it’s more like eraser stamps and not rubber). For K. She is working at the same daycare center as the one my kids are going to now. She absolutely loves it there! She told me, with tears in her eyes: At [..] we had 1 meeting in the 4 1/2 years I worked there. It was all communication in one direction: they had to do it like this. Last Thursday, she had her first meeting at the new daycare facility. They asked for her input, listened to her ideas and thought with her. Management and staff are one team. I am very glad she found this place, as I think she would have “rusted” at the other place: become used to it and take that as the standard, while a daycare center can be so much more then that. Stamps used: Crafter’s Companion sentiment, rose from Christina Renée, Le Petit Prince and his shieep handcraftet by/from Memi’s Rainbow on etsy. For L. Or K? It is possible I changed my mind at the last moment. She worked a lot with the afterschool care children. I’m not sure if she has a new job allready. Stamps used: Sentiment from Crafter’s Companion, performers from Christina Renée. For K, althought the “all things grow with love” might have been more suitable as she’s pregnant 🙂 She hasn’t got a new job yet, and as she’s pregnant she’s taking it a bit easy. Stamps used: Sentiment from Stampendous, fairies/pixies/performers from Christina Renée. Three of the staffmembers found a job at an organizatoin that had just closed their facility in this village 1 1/2 years ago, as it wasn’t profitable anymore. Now they arranged for a very fast reopening and took on three people of this staff. Many of the children are going there now. Three haven’t gotten a job yet (one just got a baby, one is pregnant now and the other one needs more hours). One I don’t know, and one now works at the daycare center where my youngest kids are going. The oldest is going to school now so needs afterschool care, which he has at Moerveld. Although making the cards costs me sleep, I’m quite proud of them (despite sometimes offlining them when matting them on the card – I was too tired to bother). I really like this series. Also, it feels good that I was able to do all this – set up this facebook group, get a group of people who wanted to contribute for a gift, get the gift and make the cards. A lot of work, but that’s just it: it’s the personal things that makes it count, that makes me feel very good about this. (Patting myself on the shoulder a bit). I am very often unable to help – I can’t come over to people to help as I’ve got my own children to take care of. But making people happy with my hobby is worth a few hours. One can say that something needs to be done, or this or that should happen, or we’re all very sorry about how things went, but take action upon it quick. Don’t wait for a few weeks – the initial feeling of unjustice has subsided, and you carry on with your life. The staff would have felt a bit disappointed maybe at how easily they have been forgotten. Now, when having acted upon my feelings, the staff knows how much they are appreciated. Sure, people could have gotten something themselves, but that is not possible for everyone. And even if no one had participated, I’m sure I’d have made the cards and gotten them gifts, maybe not this big but something nice still. Thanks for reading this wall of text and images if you’re still here. Now it’s really bedtime for me, have some sleeping to do! This card I made for a collegue whose second son was born on Christmas day. I used to work with him a lot, but then I moved and now I am attached to another office of the company and also I do not work at the office anymore but am working at a clients office. I only heard last month that his son was born. There was less good news with that news too: the little boy was in the hospital with an unknown infection. The top stamp I had seen at VivaLasVegaStamps a while ago allready, and had revisited the site and revisited. This stamp still stayed on my wishlist. It reminds me of the old fairytale books I used to read, this style of drawing. Recently they had a big sale, and having some money to spare again I finally placed an order, inclusing this stamp. (Fairy Princess – 18095). This was before I knew about the day of birth of this boy. So when I heard the news, I went through my stash of new stamps (I usually start there) and saw this one. This one was perfect. The name means “(the)blessed”. And born on Christmas day? – This stamp was perfect. A fairy, sending blessings out over his name, winter in her hands. I stamped her in blue, as she is an ethereal being and not present in this world. She is only visible for those who look. For babies, who are still partly connected to the spirit world. Also the sun, symbol for light or enlightment, fit together with the crane perfectly. The crane stands for luck – it is said a crane brings good luck. Some light in dark times: the birht of the boy. The light also is hope, and luck from the crane, for a good recovery. Stars ofcourse also match his birth day. The first letter is a stamp from a steampunk VLVS alphabet set, and the others are die cut from a Sizzix alphabet die (inked with stazon moonlight blue). The crane is from Designs by Ryn, and the sun from Stampinback. The text is from Stampendous (I think) – it’s also the only black on the card, the main colours are blue and yellow (and gold, if you don’t count that as a shade of yellow). The star stencil from The Crafters Workshop. The banner from Sizzix/Tim Holtz. The crackle stamp is from Indigo Blue. Hmm that is stamped with onyx black I think – I meant to use the grey versafine but had mistakenly taken the onyx black. The stars where first bright yellow, with acryllic paint. Too yellow to my liking, too harsh. So I put some distress ink antiqued bronze over it, just very lightly, to tone down the yellow and make it shimmer a bit at the same time. The sun is embossed on parchment paper, and then cut out. I made several, but one was enough. I had also embossed and cut out several more birds (on plain cardstock): 2 for the parents, and 1 for his older brother who has pneumonia. (Hopefully that is over by now). The card would be too busy if I added all 4, and it was about a birthcard for the youngest. I had allready sent a different card with well wishes for their health. It’s quite a large card, fits just in a standard wide envelop (for A4 paper folded in 3). I do like the card a lot, with it’s symbolism and meaning. Hopefully my collegue recognizes the meaning, and hopefully he and his wife enjoy the card. AWOL – where have I been? Well, I’ve been busy again, with lots except cardmaking. I sent half my relatives&friends christmascards after 4th of January (maybe a handfull got them in time as I brought those with me, but hadn’t finished the rest yet). The other half of the relatives&friends didn’t get a card. Who did or did not get a card was kind of random, I had printed out the adresses on stickers, and just took a card, scanned the list to see who would match with the card, of the other way around. I still had lots of unposted cards, so I’ll show you now in almost random order. Most used stamps: Chocolate Baroque and Design by Ryn. Most used materials: Distress ink and Caran D’ache (or was it arche?) Neon colors. Most used technique: stamping (duh), masking, sponging. Some dry and heat embossing as well, and some dies are used. You’ll see all pictures in the slideshow gallery first, beneath that is the thumbnail gallery. Most cards deserve a bit more spotlight though, as ofcourse details get lost on thumbnail size images :P. Maybe I”ll show them full size in a post another time. Want to know more details about used materials or how I did it? Just ask, I am be happy to answer! Raindrops & leaves by Design by Ryn. With an Indian image from Trishia of French Kissed postcards, made back in july. Background is a wallpaper sample, slightly inked on the edges. Ooh I loved this one, been saving it for a special blogoccasion. The women is made of multiple layers. Stamps from Chocolate Baroque (I think, it was in a grab bag). Text is from erm….another company. 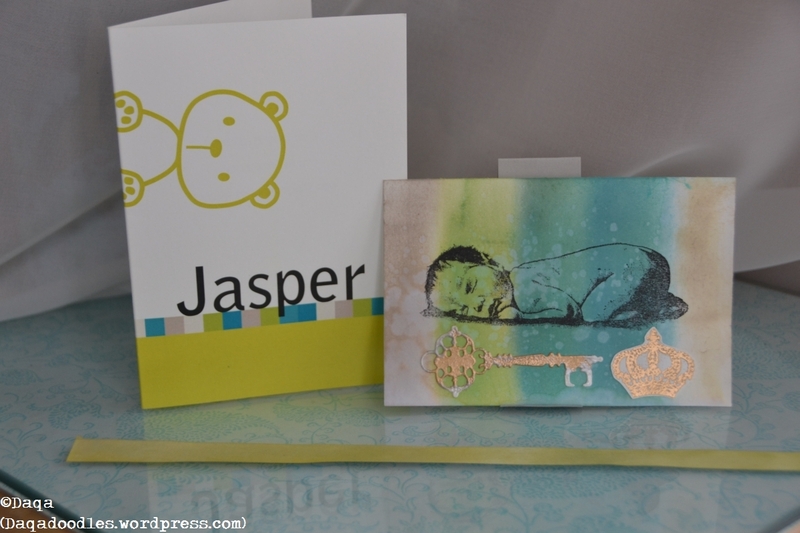 2 different embossing folders used for the background. This one was for one of my nieces. I like the scenerey a lot. All stamps from Chocolate Baroque. Made back in july, this paper origami flower with stamps from Design by Ryn and Chocolate Baroque. Made by my son, with Distress ink and water. I pressed the distress inkpad onto an acryllic block, sprayed some water on and he could paint with a brush. He chose the colors. Sometimes turning the acryllic block over and smooching it over the paper. A collection of several mermaid cards, stamps (mostly) from Chocolate Baroque. Yes, these are the raindrops from Design by Ryn. I heat a rubber block thingy (forgot the name), then pressed the stamp into that. It cools quite fast, and then you have the negative of the stamp. I turned it upside down and made balloons out of “tears”. Stamps used on the flowers and cloud (swirly kind and the leaves) are also from Designs by Ryn. A little detail of the balloons card, I loved the vintage-y summer colours. Butterflies and fairy are from Chocolate baroque, dies from Marianne Design and maybe Joy! Crafts. I love to try out different colours. Who knows how mythical worlds look? The toning of her body, the shadows – I didn’t know I could do that! This is a card I almost didn’t want to give away. I just loved how the colouring ended up, and the glimmer on her tail. I used a lot of masking on this card, although it’s just one (or was it more?) stamps from Chocolate Baroque. Can you see the shimmer on the tail? Another card with the negative (via a magic foam block) with the Design By Ryn raindrops. (Leaves also). Umbrella is from stampinback if I remember correctly. A steampunk stamp girl, and I gave her wings with the steampunk umbrella stamp. This card I made for a neighbour who watered our plants while we were on vacation in a very hot week. This card will not leave the house being sent to someone, unless I cut out the middle again and do something else with it. It was an experiment. Can you tell that I like this card very much as well? Design by Ryn raindrops and Chocolate Baroque flower. The flower emits warmth, scent, or the steam kind of thing you sometimes see after a rainshower in the summer. I heatembossed the edges. A challenge for myself. Use the laminate sample sheets, which are very glossy. Yup, this was a card for a man, nad I am quite satisfied with the result. I printed this lovely lady from French Kissed onto an old bit of a pillow case. She’s still lying like this in my cupboard, waiting for me to do something more with it. (But me and sewing don’t go well together). This is the same mermaid as stamped somewhere else on this post, but I think this was a different card, but you can see bits of the process / masking here. This mermaid is just stunning. This one I made after the other one, but I liked the results just as much. Design by Ryn swirls meet Chocolate Baroque mermaid. Oh look, here’s the pair of pretties! yup, face needs paint too. Hmm I could have cleaned her up a bit more, but at the moment I thought it was the charme of handmade and watercolouring. (with either Caran D’arche neon colours or distress ink). Just don’t stand too close when you look at it ;). Experiment with aluminium foil. I think this is about as far as it got. More masking technique. Stamps from Chocolate Baroque. oh I painted it a bit more. Oh and this one! it’s still unfinished as I am afraid of ruining it. I love how I coloured the dragon and the fire. You’ll see in the next pictures. Heat embossed, painted with D’aran Cache neon colours (I think), or was this still only with distress ink and water? Chocolate Baroque dragon and I think it’s a stampinback knight. 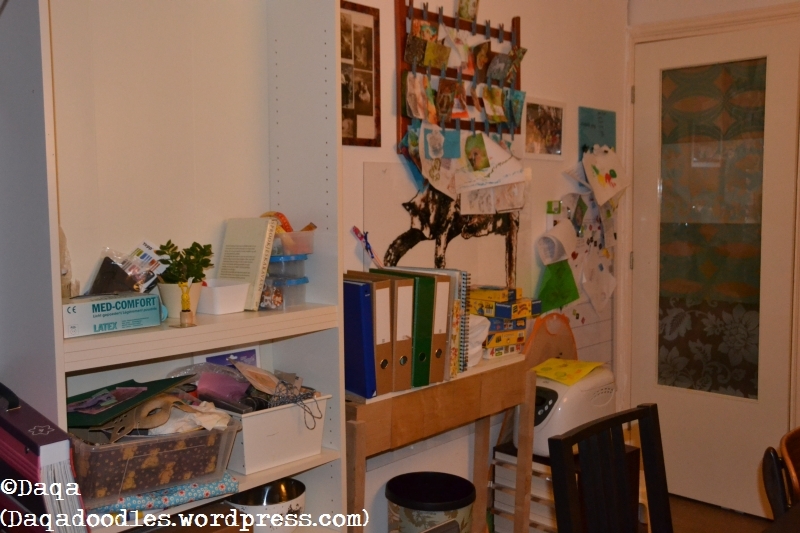 It’s like a hurricane was in the dining room – why? I’ll explain further down the post. Somewhere in between creating the hurricane-look I also made a card for the son of a friend, who will be 5 (or was it 6?). He is really into public transport, so I did my best to relate to that. I started out with a tardis from Vivalasvegastamps and chalk (well I did that (the tardis) more for his mother, who probably knows dr. Who), a track from Stampinback and a Thomas the Train stamp-cut out. And some balloons. 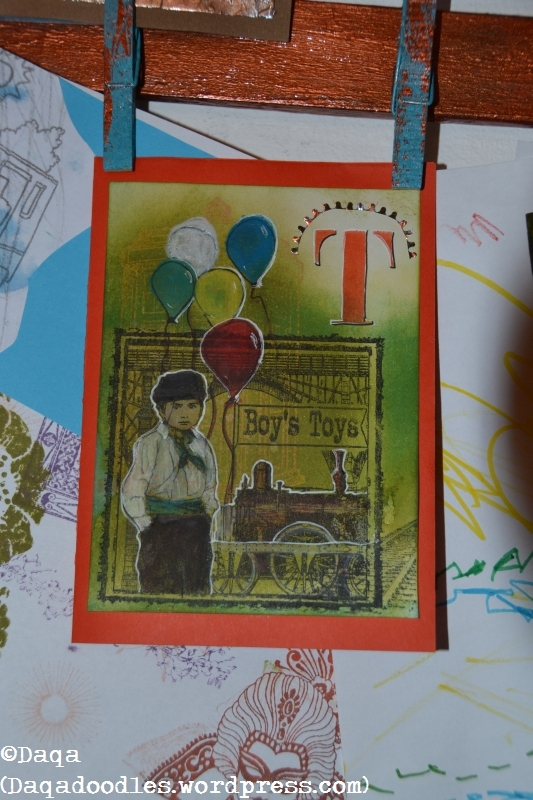 After I had done my best to colour in the balloons with my Neocolor crayons to get a good color coverage, I remembered another stamp from Crafty individuals: Boys Toys. Stamped that on top and then I had to “fix” the balloons a bit. I used my white gelpen freely. I would use it less if I had thought of that stamp sooner, but now it was just too much going on on one layer, I used it to create another layer. More Caran D’ache Neon Colors later, and gluing it on a red card and it was done. The idea was that T. would be making a drawing, but he got caught up in “cutting”. I just recently started to let him cut with a real steal (childrens) scissors, as the so called safe ones from plastic are too difficult to cut with. First, he got a little plastic scissors which was in a drawing set. It didn’t cut, so I searched for my old one when I was a kid, but the blade was loose so that didn’t really cut either. Then I bought plastic scissors which were a bit bigger, thinking those would be better then the first ones as it wasn’t included in a cheap set, but they didn’t cut. Today I bought metal childresn scissors, they cut perfectly. Only they are for left-handed children, and although T doesn’t have a clear preference yet, I think he’s right handed…. so… *sigh* still not the righ scissors. so he was cutting enthousiastically, and not really making anything anymore, he was just cutting. Even in his drawing. The remaining bit of paper looks too much as a left over to be given. So after he went to bed I finished my card (I stopped at the balloons bit, so when I got back to the card I remembered the stamp). I also told you my daughter will be 1 soon. 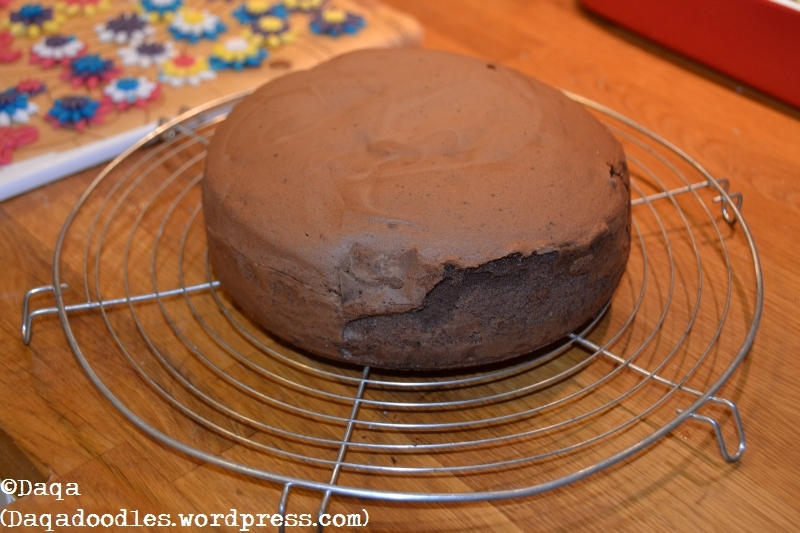 I am preparing a little bit for it, I made a small chocolage “biscuit” cake tonight, and put it in the freezer. A day before her birthday I’ll get it out and decorate it more. I also have to make a bigger cake. Theme for the cakes will be Maya de Bij. 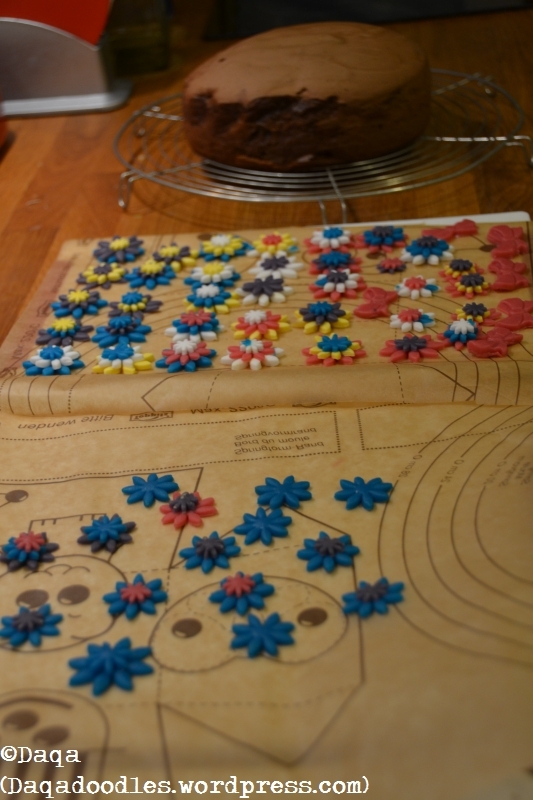 It is not going to be very fancy, just green fondant over the cake (oh and some filling, don’t know what yet) and then these flowers I made tonight as decoration, together with a toy Maja. Not really perfect… my previous “cake biscuits” ones were better. I guess that’s beginners luck. Flowers and bows. Flowers with cutters from Albert Heijn (a Dutch big grocery chain), and the bow is from a mould. When I was done I remembered I hadn’t thought of the treats for the daycare! How could I forget! Luckily I still have 1 week to think of something. So, back to the hurricane. In my previous post I mentioned renovation, storing and storage. So I am in the process of cleaning out cupboard and organizing my crafting stuff. I knew I had lots of wasted space (and lots of waste too, actually, because of bad usage of storage. I’ve got 3 Ikea drawer chests, (If that is the right english word for “ladekastjes”) – they don’t sell them anymore, but ever since my previous move (so not the last one but the one before that) some of the drawers were kind of filled with stuff I didn’t know where to put or which I still had to sort. Others kept my jewelry making stuff (nothing fancy like gold or silver, but the beads kind of jewellry). I haven’t made a necklace or a bracelet in ages, and still the beads and tools were taking up 2 drawers. I moved most of it into 1 drawer now, and plan to use it on cards. My inks and inking tools were kept in little shoeboxes (childrens shoeboxes are great storage – they still fit inside the cupboard, as opposed to some of my shoeboxes which are just an inch too long to put in efficiently). Anyway, the inks have moved to the chest of drawers, and I added wheels to the bottom, and moved the whole thing under the dining table. Tadaaa! The 2nd cupboard is dedicated entirely to my kids crafting, none of my stuff in there (ok except for printing labels). Also with weels, and on the other side under the table. Halfway – the little sidetable I made on a blue monday in furniture / woodworking school, it was behind a big chair but placed here because it would go to storage. Ofcourse it got used immediately to put my binders with stamps on, while I was cleaning out the bookshelves on the left. The top between the lower and upper cupboard on the left also is full of stuff that needs to be sorted. Laundry is under the kids chair. 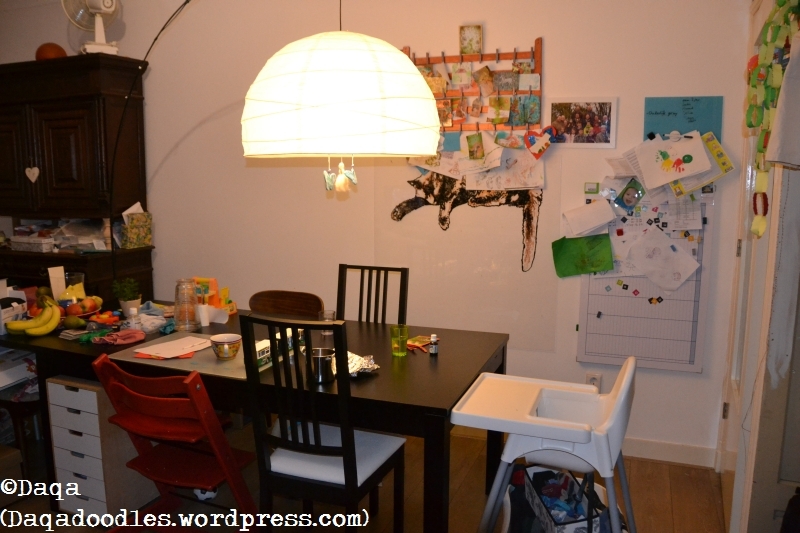 See the chest of drawers next to the red childrens chair? On the other side of the table is my chest of drawers. I know the memoboard is full too, it can be taken off as well, but first I’ll sort all the loose stuff that is lying around. I think you’ve seen enough junk and chaos. I’ll conclude this post with a beautifull image. Please respect the authors copyright, and if repinning/sharing it, include the name of the artist and website. (phatpuppy facebook.com/phatpuppyart). Pinned on Pinterest “My World and Welcome to It by phatpuppy (facebook.com/phatpuppyart) By request of the artist: please do not remove artist name or facebook link when repinning. Renovate, birthday, store, sort, fix, clean, sell? Lots of words, none to do with the card, but all to do with my life now. It’s a busy time, with the first birthday of my daughter coming up, more progress in renovating the appartment as we really want to put it on the market soon, also we have rented storage space to put our surplus of things in while we renovate. So that means storing things. Which means sorting things. Which means reorganizing, throwing stuff away, making decisions what goes where, what to keep and what to store later. Later? Yes, later. We’ll have to rent a bigger storage when we want to sell – right now we just want more room to renovate. The required space when we want to sell would be about as much as our appartment :P. No, I’m not looking forward to be selling a house. Why? 2 reasons. First reason is 2 1/2 years old, and the second will be 1 years old soon. We would love to be moved into a new home before T. is 4 though, the age when he has to attend school. Preferrably we’ll move a bit sooner so he can make some friends at the daycare before going to school. (We’d be moving halfway across the country, near family and a house with a garden and garage). I love living here in Den Haag with my friends near, but I do miss a garden and garage. Here it’s quite expensive, or you’d have to move to one of the smaller villages near here, but then I wouldn’t be living “here”, where I do now. And in that case, I’d rather move south where houses with gardens and garage are still in our budget range and where we will live near family. On to the card now. A while ago we received this birth announcement card. I love making a card which is based on their card (see also my post “Copy Cat” where I made two baby cards based on the announcement card). 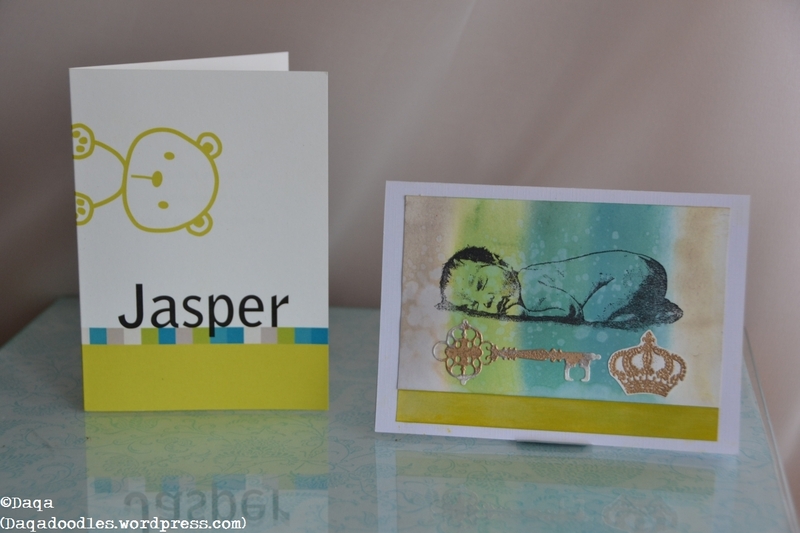 Jasper means treasurekeeper, that is why I added the sleeping baby on top of the key and crown. Getting the color right was difficult! 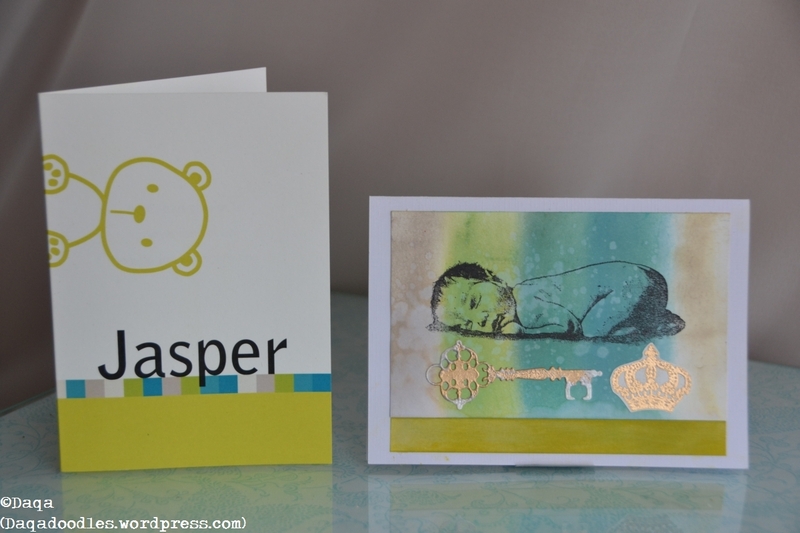 The baby stamp is from Stampinback (Sleeping Baby SB 816), the crown from a Primna Marketing set(Viva Decor: Crown, Lion, Wing set), and the key is a Marianne Design creatable (LR0193- – Key). Embossed with queens’gold embossing powder and a little silver embossing powder on the key as well. Oh, before I show this card: The paper version didn’t include a name – it did include an instruction on how to use layar for it. Then you saw the full card with all details! I loved that! IT and cards :D.
So I wanted to include the pink and blue, the bird and egg, and her name. In that, I managed. 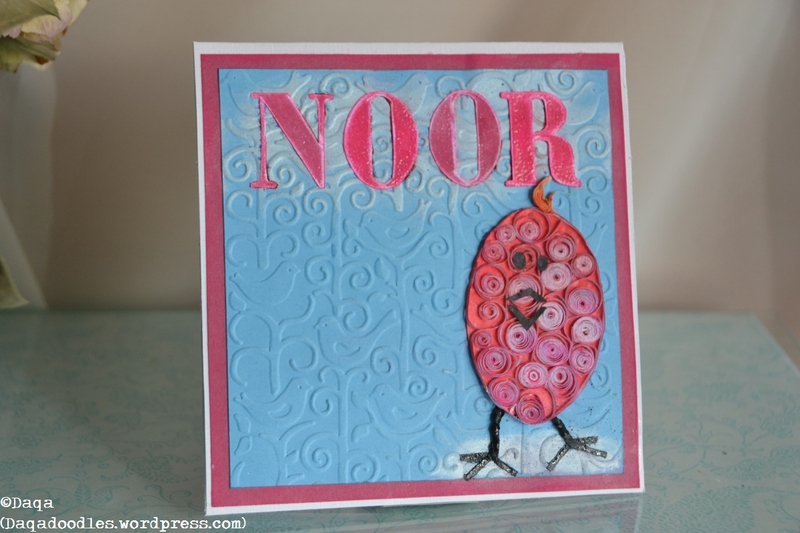 I messed up when wanting to add some highlights to the card (before placing the letters) and where the chick would stand. I was originally thinking of making an egg with feet, but somehow I forgot that idea and made a chick of it, but the shape is more egg like. Also the style is too cute still, not “modern” enough to really fit with this card. So not my best card. 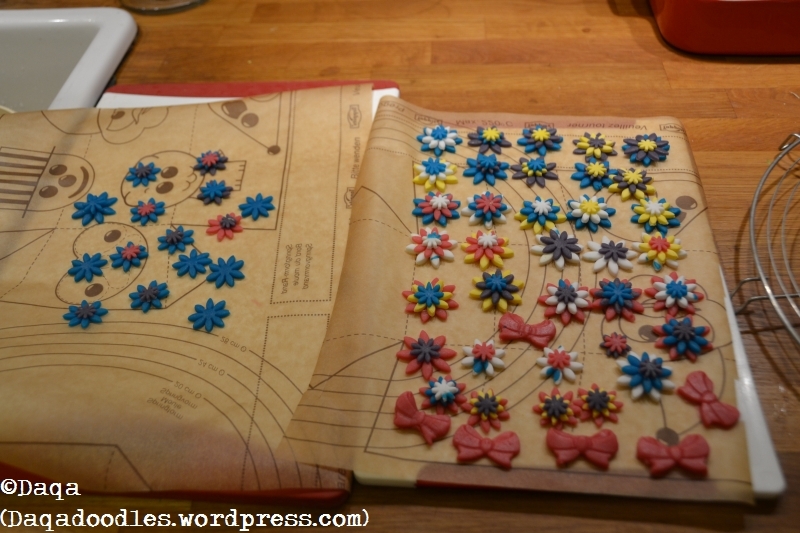 The quilling was new, I made the strips with Nellie Snellen’s die, but it doesn’t cut really sharp strips of paper. I rolled them anyway, and inked it a bit, trying to give the chick some depth. (I know, the light part should be on top if that’s where the light is coming from…) In the end, I did like the embossed letters a lot, although maybe I should have sticked to 1 color pink. (the embossed twisted paper legs were a horror to make).